The Southeast Connecticut World Affairs Council (SECWAC) presents Ivo H. Daalder and James M. Lindsay to speak on “America’s Abdication of Global Leadership” at 6 p.m. on Thursday, May 2, at the First Congregational Church of Old Lyme at 2 Ferry Rd., Old Lyme. Members and guests are encouraged to RSVP via online registration, but walk-ins will be accepted. A reception will begin at 5:30 p.m., with the main event beginning at 6 p.m. The three pillars of the postwar foreign policy that America created—strong alliances, open markets, and commitment to democracy and human rights—are under threat from a president who sees little value in them, according to Ivo H. Daalder and James M. Lindsayin their new book, The Empty Throne: America’s Abdication of Global Leadership. Meanwhile, “A majority of Americans has consistently favored American engagement abroad,” the authors note. In fact, they argue that public support on issues such as defense of allies and the domestic economic benefits of trade actually increased after Trump took office. In a complementary essay in the November/December issue of Foreign Affairs, Daalder and Lindsay called for a “G9” of like-minded nations to maintain the rules-based order. “The major allies of the United States can leverage their collective economic and military might to save the liberal world order. France, Germany, Italy, the United Kingdom, and the [European Union] in Europe; Australia, Japan, and South Korea in Asia; and Canada in North America are the obvious candidates to supply the leadership that the Trump administration will not,” they write. Daalder is President of the Chicago Council on Global Affairs. He served as the US ambassador to NATO from 2009-13. Prior to that he was a senior fellow in foreign policy studies at the Brookings Institution, and an associate professor at the University of Maryland’s School of Public Policy and director of research at its Center for International and Security Studies. He also served as director for European affairs on President Bill Clinton’s National Security Council staff from 1995-97. Ambassador Daalder is the author and editor of ten books (including two with James Lindsay), and is a frequent contributor to the opinion pages of the world’s leading newspapers. He was educated at the universities of Kent, Oxford, and Georgetown, and received his PhD in political science from the Massachusetts Institute of Technology. Lindsay is Senior Vice President, Director of Studies, and Maurice R. Greenberg Chair at the Council on Foreign Relations. 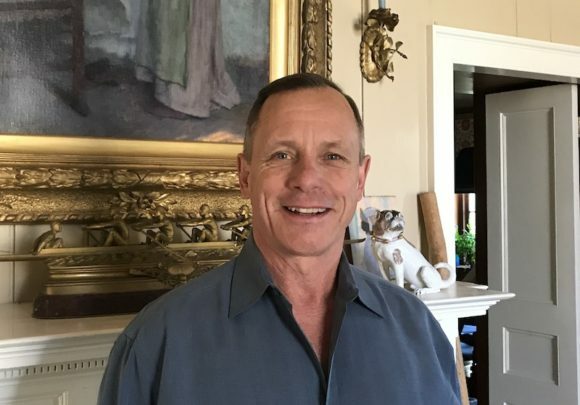 He was previously the inaugural director of the Robert S. Strauss Center for International Security and Law at the University of Texas at Austin. He has also held positions at the Brookings Institution and the University of Iowa. From 1996-97 Lindsay was the director for global issues and multilateral affairs on the staff of the National Security Council. He has written widely on various aspects of American foreign policy and international relations and has co-authored two books with Ivo Daalder. Lindsay holds an AB from the University of Michigan, and an MA, MPhil, and PhD from Yale University. Signed copies of Daalder and Lindsay’s book, “The Empty Throne: America’s Abdication of Global Leadership” will be for sale after the presentation). The presentation is a part of the SECWAC 2018-2019 Speaker Series. For non-members, tickets ($20) may be purchased at the door; ticket cost can subsequently be applied towards a SECWAC membership. Attendance is free for SECWAC members (and their guests). Pro-rated half-year membership was introduced in February; half-year membership February through June 2019 is $37.50; $12.50 for young professionals under 35; free for area college and high school students. Immediately following the presentation, attendees have the option for $35 of attending a dinner with the speaker at the Old Lyme Country Club. Dinner reservations are required by the morning of Tuesday, April 30, via pre-registration and making a payment securely online, calling 860-912-5718, or emailing info@secwac.org (vegetarian option available if reserved in advance). SECWAC is a regional, nonprofit, membership organization affiliated with the World Affairs Councils of America (WACA). The organization dates back to 1999, and has continued to arrange 8-10 Speaker Series meetings annually, between September and June. 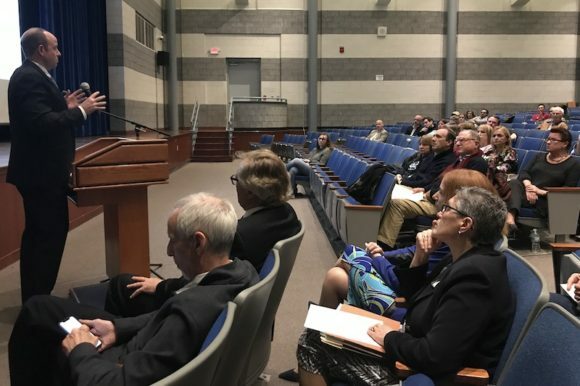 The meetings range in foreign affairs topics, and are hosted at venues along the I-95 corridor, welcoming members and guests from Stonington to Old Saybrook, and beyond. SECWAC’s mission is “to foster an understanding of issues of foreign policy and international affairs through study, debate, and educational programming.” It provides a forum for nonpartisan, non-advocacy dialogue between members and speakers, who can be U.S. policymakers, educators, authors, and other experts on foreign relations. Learn more at http://secwac.org. How does it look? Intake for Child & Family’s Annual Sale is Tuesday in Old Lyme. 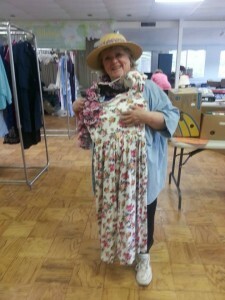 The Lyme/Old Lyme Auxiliary of Child & Family Agency of Southeastern Connecticut has scheduled its Intake for donations to the Agency’s 65th Annual Sale. Donations will be accepted ONE DAY ONLY, on Tuesday, April 23, from 10 a.m. to 1 p.m., at the First Congregational Church of Old Lyme, in the Sheffield Auditorium on Ferry Road. Note that this will be the only day to bring items for donation in Old Lyme. In addition, because the Annual Sale will be located in a smaller-than-usual venue this year, we must limit our collections and so will only be accepting donations for three hours, 10am to 1pm, on April 23. Items accepted include art work, men’s, women’s, and children’s clothing; books, records, CDs and DVDs; toys; small appliances; household items; linens; jewelry; tools; and more. All items must be in extremely good condition, i.e., clothes and linens must be clean with no holes or stains, and appliances must be working. A full list of items that we cannot accept will be available at the Intake location. Child & Family Agency’s 65th Annual Sale will be held at St. Paul Church, 170 Rope Ferry Road, Waterford, May 2–4, 2019. For more information on the sale, call 860-443-2896 or visit www.childandfamilyagency.org. Child & Family Agency is a private, nonprofit organization whose mission is to nurture children and families to develop their strengths through service, partnership, and advocacy. With offices in New London, Essex, and Groton, and programs dealing with children’s health care, child abuse, family violence, teen pregnancy, parent education, and child guidance, Child & Family Agency is the largest nonprofit children’s service provider in southeastern Connecticut. Volunteers and supporters are always welcome. For more information, see www.childandfamilyagency.org. Questions on the April 23 Lyme/Old Lyme Intake may be directed to cfa.LOLauxiliary@gmail.com. Brady Sheffield (second from right) receives his Lyme-Old Lyme Chamber of Commerce April 2019 Business Student of the Month award from (left to right) Rich Shriver,, Lyme-Old Lyme Chamber of Commerce President; Jeanne Manfredi, Lyme-Old Lyme High School Assistant Principal, and Leslie Traver, Lyme-Old Lyme High School Business Department Chair. 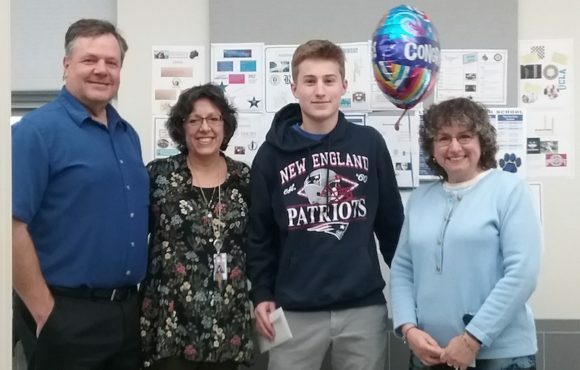 Lyme-Old Lyme High School junior Brady Sheffield has been named the Chamber of Commerce Business Student of the Month for April 2019. Brady plans on working for his uncle’s social media company to learn about running a business — a nice tie in to the business classes he has taken. The Chamber Business Student of the Month program continues the Chamber tradition of recognizing members of the junior class for demonstrating outstanding initiative in and out of the classroom. The Lyme-Old Lyme Chamber of Commerce established the N. Rutherford Sheffield Memorial Award for Entrepreneurial Promise & Achievement for Lyme-Old Lyme High School juniors in 1999 as a way to honor Mr. Sheffield, a 50+ year member of the Chamber who was highly regarded in our Lyme-Old Lyme community. Thirty-five juniors at Lyme-Old Lyme High School were recognized through this program. 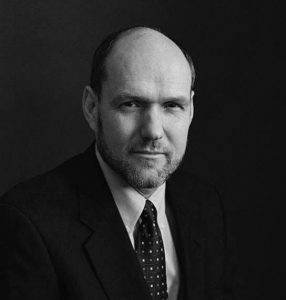 The Southeast Connecticut World Affairs Council (SECWAC) presents Stephen Walt to speak on “America’s Foreign Policy Elite and the Decline of U.S. Primacy” at 6 p.m. on Thursday, April 25, at the First Congregational Church of Old Lyme, Ferry Rd., Old Lyme, CT 06371. Members and guests are encouraged to RSVP via online registration, but walk-ins will be accepted. In 1992, the United States stood at the pinnacle of world power, and Americans were confident that a new era of peace and prosperity was at hand. Twenty-five years later, those hopes have been dashed. Relations with Russia and China have soured, the European Union is wobbling, nationalism and populism are on the rise, and the U.S. is stuck in costly and pointless wars that have undermined its influence around the world. The root of this dismal record, Stephen Walt argues in his new book “The Hell of Good Intentions” (signed copies of which will be available for sale after the presentation), is the foreign policy establishment’s stubborn commitment to a strategy of “Liberal Hegemony.” Walt argues for a return to the realist strategy of “Offshore Balancing,” which eschews regime change, nation-building, and other forms of global social engineering. Walt is Robert and Renée Belfer Professor of International Affairs at the Harvard Kennedy School. He is a contributing editor at Foreign Policy, co-editor of the Cornell Studies in Security Affairs, and was elected a Fellow of the American Academy of Arts and Sciences in May 2005. He received the International Studies Association’s Distinguished Senior Scholar award in 2014. His writings include The Origins of Alliances (1987), Revolution and War (1996), Taming American Power: The Global Response to U.S. Primacy, and The Israel Lobby and U.S. Foreign Policy (co-authored with John J. Mearsheimer, 2007). 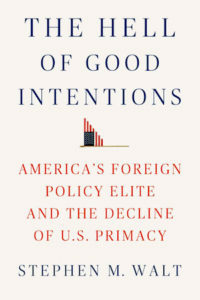 His latest book is The Hell of Good Intentions: America’s Foreign Policy Elite and the Decline of U.S. Primacy (2018). A reception will begin at 5:30 p.m., with the main event beginning at 6 p.m. The presentation is a part of the SECWAC 2018-2019 Speaker Series. For non-members, tickets ($20) may be purchased at the door; ticket cost can subsequently be applied towards a SECWAC membership. Attendance is free for SECWAC members (and their guests). Pro-rated half-year membership was introduced in February; half-year membership February through June 2019 is $37.50; $12.50 for young professionals under 35; free for area college and high school students. Immediately following the presentation, attendees have the option for $35 of attending a dinner with the speaker at the Old Lyme Country Club. Dinner reservations are required by the morning of Tuesday, April 23,via pre-registration and making a payment securely online, calling 860-912-5718, or emailing info@secwac.org (vegetarian option available if reserved in advance). On Friday, April 20, an inter-denominational ‘Walk to End Hunger ‘will be held to benefit the Shoreline Soup Kitchens and Pantries. Gather in the Griswold Room of Saint Ann’s Episcopal Church at 9:45 a.m. for sign-in and prayer. The route follows Shore Rd. to Johnny Cake Hill Rd. to McCurdy Rd., past Christ the King Church to First Congregational Church, and then back again, a distance of approximately three miles. All ages are welcome and encouraged to to join this reflective walk co-organized by Christ the King Catholic Church, St. Ann’s Episcopal Church, and First Congregational Church of Old Lyme. Even if you are unable to walk, you can contribute by sponsoring a walker. Envelopes for monetary donations can be found on the counter outside the Griswold Room and at the walk. Participants are asked to bring a non-perishable food item. Photo by Aaron Burden courtesy of Unsplash.com. Christ The King Church hosts the Mass of the Lord’s Supper at 7 p.m.
Saint Ann’s Episcopal Church hosts a Maundy Thursday Liturgy at 7 p.m. with washing of the feet, Holy Eucharist and Stripping of the Altar. The First Congregational Church of Old Lyme (FCCOL) hosts the traditional service of Tenebrae at 7:30 p.m.
An Inter-denominational Walk to End Hunger will be held for the Shoreline Soup Kitchens and Pantries. Gather in the Griswold Room of Saint Ann’s at 9:45 a.m. for sign-in and prayer. The route follows Shore Rd. to Johnny Cake Hill Rd. to McCurdy Rd., past Christ the King Church to First Congregational Church, and then back again, a distance of approximately three miles. All ages are welcome and encouraged to come. Even if you are unable to walk, you can contribute by sponsoring a walker. Envelopes for monetary donations can be found on the counter outside the Griswold Room and at the walk. Participants are asked to please bring a non-perishable food item. Christ The King Church hosts the Passion of our Lord and Veneration of the Cross at 3 p.m. and the Stations of the Cross at 7 p.m. followed by Confessions. 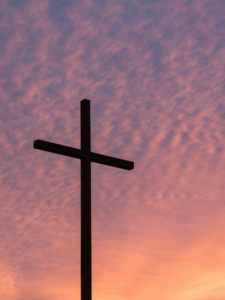 Saint Ann’s Episcopal Church hosts a Good Friday Liturgy Service at 12 p.m. There will be no celebration of the Holy Eucharist. The veneration of the Cross will take place outside – weather permitting. Christ The King hosts Blessing of the Food at 12 noon and an Easter Vigil Mass at 8 p.m. with choir, organ, timpani, and bells. a Mass of the Lord’s Resurrection at 8 a.m. and with choir and orchestra at 10:30 a.m.
Worship services at 9 and 11 a.m.
For more information, visit this link . Festival Holy Eucharist with full choir and instruments at 8:30 and 10:30 a.m. The Old Lyme Board of Selectmen will hold a Special Town Meeting Tuesday, April 16, to announce the 2018 Citizen of the Year. The announcement, which is normally made at the end of January, had to be postponed from the previously scheduled date this year. The meeting will take place at 7:30 p.m. in the Meeting Hall of Old Lyme’s Memorial Town Hall at 52 Lyme St.
To consider and act on a proposal for the Town of Old Lyme to add 200 s.f. of Town-owned land to the area it is currently leasing out at the Boughton Road Fire Station at 189 Boston Post Rd., in Old Lyme to allow for an additional antenna to be installed on the cell tower now on the site and to make room for supporting equipment to be kept/ installed there. To consider and act on proposed amendments to the Town’s Solid Waste Ordinance. Copies of the proposed lease amendment and of a plan showing the current and proposed additional leased area and copies of the proposed amendments to the Solid Waste Ordinance are available on the Town website at www.oldlyme-ct.gov, and in the Town Clerk’s office at Town Hall during normal business hours. The Old Lyme Board of Finance will conduct a Public Hearing on the Proposed Town Budget for Financial Year 2019/2020 this evening at 7:30 p.m. in the Meeting Hall of Memorial Town Hall. The proposed budget can be viewed at this link. 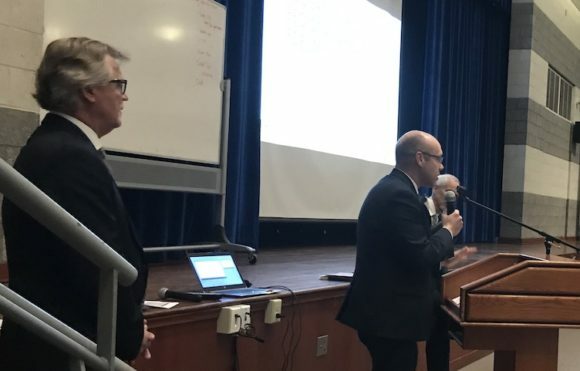 It includes a request from Region 18 (Lyme-Old Lyme Schools) for $27,556,679 although this amount has not yet been approved by the voters of Lyme and Old Lyme. A referendum on the Region 18 budget of $35,084,758 will be held on Tuesday, May, 7, with a simple majority required across the votes from both towns to pass it. 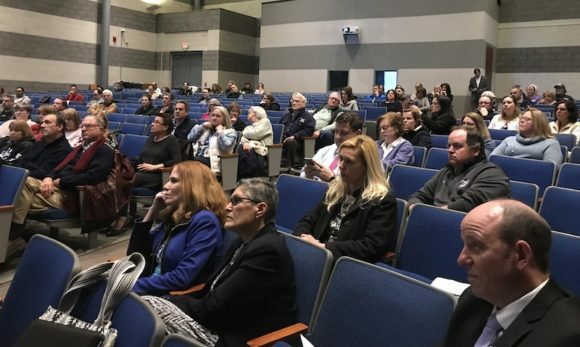 After the Region 18 budget has been passed, the share to be paid by Old Lyme (which relates to the respective percentage of students in Region 18 from each town) will then be added to the Town of Old Lyme’s budget and that combined budget will be voted on at an Old Lyme Special Town Meeting later in May. 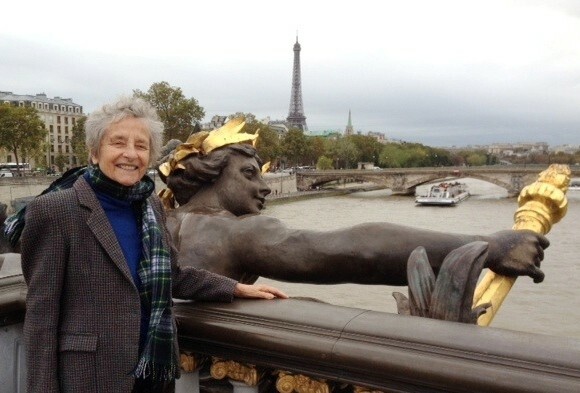 Doreen Meyer, age 86, passed away peacefully April 4, 2019 at home after a short illness with her family by her side. 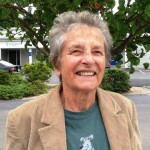 She was born in 1932 in Cambridge, Massachusetts to Stanley and Helen Arnold. She married her true love Robert Charles Meyer, in June 21, 1953 and they shared 66 wonderful years together. She graduated from the prestigious Katherine Gibbs School in Newark, NJ. Doreen was a devoted wife and mother who took pride in providing a warm and nurturing home every day of the year for her family. She was accomplished at sewing, knitting, rug hooking, cooking and baking, as well being extremely knowledgeable about the history, repair and restoration of antiques. Her hands and feet were rarely still and not a Sunday went by without a “made-from-scratch” dessert for her beloved husband. Few could keep up with her abundance of energy. 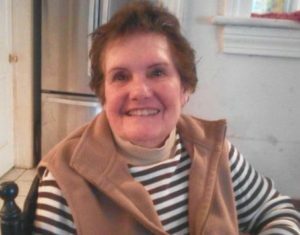 For many years Doreen worked at Coffee’s Country Market, Old Lyme, where she greeted everyone with her beautiful smile. All who knew her were attracted her warm, kind and sweet personality. Doreen will be forever remembered by her husband, Robert; their daughters, Kim Morgan and Heidi Meyer; sister and brother-in-law, Gail and Bud Nemec; six grandchildren, Devon Rust, Lindsey Morgan, Meredith Chapman, Ryan Meyer, Madeleine Meyer Schumacher, Olivia Meyer Schumacher; four great-grandchildren, Levi Morgan, Wyatt Rust, Andy Rust and Tristan Meyer as well as many nieces, nephews and friends. Doreen was predeceased by her son, Keith Meyer and sister, Audrey Lindquist. All whom she loved and touched deeply. She will be greatly missed by all who were fortunate to know her. Please join us for a Celebration of Life on Saturday, May 11, at 1 p.m., 8 Oak Tree Lane, Lyme to remember Doreen. 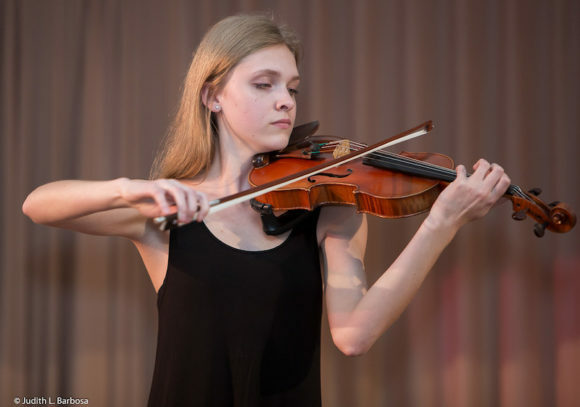 Kayla Bryan, who was last year’s Instrumental Music Scholarship winner, is shown above performing in the 2018 Top Talent Showcase. Photo © Judith L. Barbosa. Shoreline Arts Alliance announces the opening of applications for the 39th annual Scholarships in the Arts: Top Talent. This program is open to juniors and seniors residing within Shoreline Arts Alliance’s 24 town region and who want to pursue an education in the arts. Applicants can apply in seven different categories of study. The winner in each category will receive a $1,000 scholarship for continuing education and/or supplies as well as a mentorship from a professional artist in the winners chosen field. Applications are now available on the website and will be open until April 24, which will be followed by in-person auditions, interviews, and portfolio reviews on May 3 and 4. Applications for the scholarships can be found on the Shoreline Arts Alliance website. Applications can be submitted online or through a mail-in form. An in-person audition, interview, and/or portfolio review is required for each application and will take place at the ACES Educational Center for the Arts in New Haven, CT on May 3 and 4, 2019. These in person auditions/interviews/portfolio reviews give the students the opportunity to learn about presenting themselves and their art before a jury of professionals. Students who reside in the 24-town-region (region includes all of Middlesex County, Madison, Guilford, North Branford, Branford, East Haven, Lyme, East Lyme, Old Lyme, and Salem) and are interested in the arts are encouraged to apply. The categories are, Theatre, Vocal Music, Instrumental Music, Creative Writing, Dance, Visual Art, and, our newest category, the Jeffrey Dobbs Scholarship for Excellence in Painting. These seven categories are judged by professional, working artists in each field of study. These professionals pay special attention to detail, to the students commitment to the art form of their choosing, and give valuable feedback to each student. Judges choose a winner in each category and they may also choose a special recognition in any given category. Winners and special recognition winners will be asked to participate in a showcase on May 14 at Evergreen Woods. The Scholarship in the Arts program is meant to educate, encourage, enrich, and engage the students through audition practice, interview practice, and valuable feedback from professional artists. Students who are serious about their careers in the arts will be given important lessons on interviewing, preparing a portfolio for review, and auditioning. This preparation, in a safe and judgement free environment, will allow the students to feel comfortable in future interviewing/auditioning/portfolio review processes. Visit www.shorelinearts.org/top-talent to learn more about this program, find submission information, and to download the application or apply online. A $25 non-refundable fee is required for each application. Contact Shoreline Arts Alliance for further information by emailing office@shorelinearts.org or calling 203.453.3890. Governor Lamont’s tolling plan is in trouble. I knew it last weekend when I got a call from Dan Malloy. The first was Governor Lamont’s somersaults on tolling from being in favor, then promising trucks-only tolling and finally settling (again) on tolling all vehicles. Voters felt betrayed. Then Lamont pulled millions in car sales taxes from the STF, potentially bankrupting the transportation fund by 2022. Then there were the “no tolls votes” in local communities, non-binding of course, but a clear indication of local sentiment. Even Stamford’s Board of Representatives voted against tolls. Polling by Sacred Heart University, though perhaps poorly worded, showed 59 percent of respondents were against tolling. Now, Governor Lamont is on a Magical Misery Tour, holding press events at every crumbling bridge, viaduct and train platform in the state. Against those backdrops, he pitches the need for billions in funding achievable only, he says, through tolling. In the last couple of months, Metro-North has had two major power meltdowns as circuit breakers, transformers and sub-stations have failed, slowing trains and disrupting service. Commuters take such crises in stride knowing full well they’re riding in shiny new railcars on a century-old railroad crumbling beneath them. But people upstate couldn’t care less. It’s not their problem, so why should they pay tolls or support mass transit? 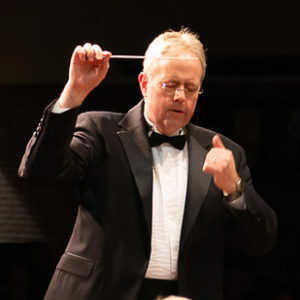 The conductor for Cappella Cantorum’s April concert will be Simon Holt. This spring brings a treat to area concert-goers: Cappella Cantorum Masterworks Chorus will perform Felix Mendelssohn’s “Elijah” Sunday, April 14, 3 p.m. at John Winthrop Middle School, 1 Winthrop Rd., Deep River. 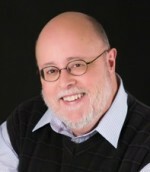 Simon Holt of the Salt Marsh Opera will direct the chorus and professional soloists and orchestra. Tickets are $30 purchased in advance, $35 at the door. They may be purchased from chorus members or on-line at www.CappellaCantorum.org. For more information, visit the website or call 860-941-8243. 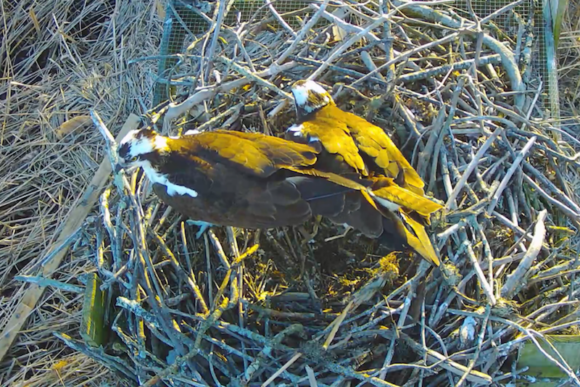 When will the ospreys return to nest at Rocky Neck State Park? This morning, Sunday, April 14, from 9 to 11 a.m. in Rocky Neck State Park in East Lyme, a naturalist from the Roger Tory Peterson Estuary Center located in Old Lyme will lead a group looking for early spring migrants and welcoming back Ospreys to their breeding grounds. Rocky Neck State Park in East Lyme is an ideal habitat for a wide variety of bird species. Join this group to explore these habitats and their occupants. Action in the House of Commons started really in earnest on Nov. 15, 2018 when Theresa May’s original deal was voted down. A second vote on the same motion, and a third with almost identical text were also rejected by the MPs. By drawing red lines, the tenacious but inflexible Prime Minister made it hard for herself to negotiate. On the eve of the March 29 deadline, the situation turned surrealistic with two superimposed pictures (to use the words of Le Monde special envoy to London) of a vote on May’s deal and eight others on alternative proposals the MPs had organized on their own. In a dramatic gesture, Theresa May used her last joker – stepping down from office – in case her deal was supported. The Prime Minister described the situation as “the end of a process” with the MPs having said no to everything : to the deal, to the absence of a deal, to Brexit, to Article 50 itself, to the eight separate proposals. In the face of this total collapse of a possible way out of this impasse, Donald Tusk, European Council President announced an extraordinary summit in Brussels on April 10. A surprising amount of information and live coverage is now appearing on the French media, shedding a new light on Brexit. One report showed to what extent the public opinion was in fact manipulated. More than 80 percent of the British press was hostile to Europe and contained “fake news” items. The “Brexiteers” promised that the Commonwealth would save the UK. The famous red bus of Boris Johnson traveled throughout the country, displaying the number of 350 million pounds sterling ($455 million) in giant letters . That is the amount “BoJo” (Boris Johnson’s nickname) claimed that the UK is sending the EU every week instead of using it to fund the National Health Service (NHS). A Canada-based web site called AggregateiQ, created by Dominic Cummings, utilized private data collected from social networks and used it to “microtarget” individuals with “dark ads.” The “Vote Leave” site used a strategy comparable to that used by Cambridge Analytica, a company heavily implicated in the 2016 US election manipulation. Other reports helped better understand why re-establishing a border between the two Irelands was a visceral impossibility. The Good Friday agreement in 1998 brought peace back but the catholic and protestant communities in Belfast, are still separated. In this fragile context, the Irish people fear that a 300-mile external border with the EU would jeopardize the hard-won peace agreement. Trying to solve the problem of a border is an attempt at squaring a circle. The only solution might be a border at the bottom of the Irish Sea. The backstop which allows the border to remain open until a final treaty is signed, is only a temporary solution. It was not until the 11th hour – or less than one week before the March 29 deadline – that a significant turn occurred in London. Prime Minister May entered into talks with Jeremy Corbyn, leader of the Labour party, in spite of their sharp disagreements. It was such a breakthrough that the Chancellor of the Exchequer Philip Hammond declared on April 5, “the threat of the UK crashing out of the Union is heavily diminished.” The Conservative party began to lean toward a “soft Brexit” and the possibility of the UK remaining in the Custom Union. During all these months, the Europeans showed a consensual unity. Their only caveat being that another delay would have to be justified by a clear plan such as general elections or a second referendum. Their patience though began to wear out by early April as some divergences of opinion emerged. The priority for Angela Merkel is to avoid a no deal Brexit and she will bend over backwards to make that happen. Although sharing many views with the UK in economy or trade, Mark Rutte, Prime Minister of the Netherlands, confirmed his alignment with the collective position. The “flextension” of one year suggested by Donald Tusk, President of the European Council, might not appeal to everybody. President Macron and EU Commissioner Juncker sound tougher on more delays. However, Macron reaffirmed on April 1, that he will stand by the decision made by Brussels and will not use his veto. The repeated postponements requested by Prime Minister May (April 12, May 23, June 30) forced the MPs to cancel their Easter recess. Much more serious, is the imbroglio caused by the colliding of the Brexit discussions with the European elections scheduled to take place May 26. This long saga turned rather nasty when Tory MP Jacob Rees-Mogg, ultra Brexiteer, tweeted on April 5, “Let us stay [in Europe] and this way we will be able to damage the Union from the inside and oppose our veto on any Brussels decision”. And so, the suspense goes on. During these final hours, the two Houses of Parliament are scrambling to find a solution and seem to agree that a no-deal Brexit is unacceptable. The Europeans do not want to push the UK out of the Union. Chances are that the outcome will be Britain remaining in the Custom union, an à la carte solution, which was almost obvious from the beginning. The British should take heart. It only took 22 years for Norway to establish relations with the EU through the European Economic Area (EEA), and 29 years for Canada to negotiate with Europe through the Comprehensive Economic and Trade Agreement (CETA)! Since all the thorny issues – the City, fishing , citizens’ rights, Gibraltar, etc – are included in the 27 pages of the non legally-binding Political Declarations, a second part of Article 50 (in other words, swept under the rug ) will have to be negotiated later . Brexit will continue to haunt both the divided British opinion and also Europe . Some may think it is the UK’s vocation is to be independent from Europe and turned toward the rest of the world. It certainly seems British people consider EU membership a straight-jacket. Interestingly, these are the same reasons General Charles de Gaulle gave persistently more than 50 years ago as to why he was against the original entry of Britain into the European Economic Community (EEC). Lyme Academy College of Fine Arts of the University of New Haven hosts an opening reception from 5 to 8 p.m. this evening in the Chauncey Stillman and Sill House Galleries for its 2019 Senior Studio Exhibition. All are welcome. The seniors whose work is featured in the exhibition are studying for a Bachelor of Fine Arts or a Post-Baccalaureate degree and will graduate in May 2019. This will be the final exhibition of student portfolios submitted for degrees before the Lyme Academy ceases to be a degree-granting college later in the year after the University of New Haven’s withdrawal. The Senior Studio experience at the College allows students to refine their vision and develop a skill set in order to create a body of work that exemplifies their individual interests, talents, and artistic sensibilities. The 2019 Senior Studio Exhibition reflects the culmination of this project. Students will be present at the opening reception and available to discuss their work. The exhibition will be on view in the gallery through May 17. Admission is free Monday through Saturday from 10 a.m. to 4 p.m. The sponsor of the exhibition is Saybrook Point Inn/Fresh Salt. Lyme Academy College of Fine Arts of the University of New Haven is located at 84 Lyme St. in Old Lyme. 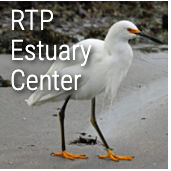 The Roger Tory Peterson Estuary Center (RTPEC) hosts an Open House this Wednesday from 6 to 8 p.m. Participate in a scopes and slime activity, learn about the Connecticut River Estuary, create your own creatures and stump the naturalist. This informative and fun night offers free entry and is open to all. The RTPEC is located at 90 Halls Rd. next to Big Y in the Old Lyme Marketplace.